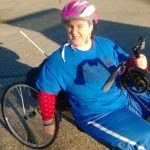 mobileWOMEN.org: The Hibernation is Over - Get In Shape with WHEELSTRONG SPORTS! The Hibernation is Over - Get In Shape with WHEELSTRONG SPORTS! With spring fast approaching (we hope! ), it's time to wake up our bodies after a long, grueling winter. Many of us crawled under our warm and fuzzy blankets, munching on comfort food and binge-watched our favorite series on Netflix to make it through this year's record breaking snow storms! Soon, if not already for some, we will start shedding our layers so it's time to get active and get in shape. You will feel better, enjoy the health benefits, look better and give your mood a boost. When you exercise, your body releases chemicals called endorphins. These endorphins interact with the receptors in your brain that reduce your perception of pain, give you a positive feeling and help you sleep. What could be better? 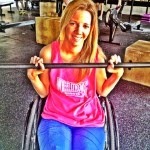 Fortunately for us, there is an online community that can help motivate us and share ideas so we can reach our workout goals, WHEELSTRONG SPORTS, Inc. .mobileWOMEN.org had the opportunity to speak with the founder, Matthew Celeberto. mW: Tell us about WHEELSTRONG SPORTS, Inc.
MC: We at WHEELSTRONG SPORTS want to unite athletes of adaptive sports into the WHEELSTRONG community. Our Goal is to inspire, motivate, encourage, support, innovate and give back to others of all levels and capabilities to help accomplish their goals. In just over 4 years, WHEELSTRONG SPORTS has donated over $4,000 in money and merchandise.We are uniting adaptive sports and the athletes that play. MW: What made you decide to start the website? MC: “I got sick of seeing people wearing Nike and Adidas and decided we need our own brand.” Also, I wanted a site for athletes of all disabilities where they can network and share their own stories. mW: How are women's fitness needs different from men's? MC: I have not noticed any difference at all. mW: How are you addressing them? MC: We reach out to women by having women submit blogs on how they do their workouts and also women submit their own workout video. mW: What are some fitness tips that you would give to women who do not have access to a gym? MC: I would give them the same advice I would give the guys. Get some light weights and start slow and light. mW: Do you have any success stories to share about women that have used your program? MC: We are developing a program now for both the men and women. We have men and woman submit their own workout blogs and workout videos that other visitors of the site use. mW: Do you have any dietary suggestions for those working out? MC: Each person’s dietary needs will be different depending on how much they workout and what type of workout they do. Any of your readers can contact us for questions pertaining to their needs. mW: How often should we work out and for how long? There is no right answer for this because everyone works out different. But I will say the body does need to rest and you know your own body. For me I go to the gym 4-5 days a week. mW: What are the future plans for WHEELSTRONG SPORTS? MC: WHEELSTRONG SPORTS is coming out with a whole new summer line of merchandise, energy drinks along with pre and post workout supplements. We also will be holding online google chats to discuss workouts and dietary needs. mW: Are the drinks and supplements that you are creating specifically for people with disabilities? Do we have different needs when it comes to supplements? MC: The drinks and supplements are not made just for people with disabilities. I have tried them and will share my experiences with them and how they affect me with my SCI. mW: How does the fundraising aspect work with WHEELSTRONG SPORTS? MC: How we help with fundraising is different for each person or organization. We find out their needs and make a game plan that works best for them. We can sell shirts with both of our logos until we reach the goal amount. We send out letters, emails, promote on all our social media and website. mW: Any other information that you would like to share? MC: We just created a page called WHEELSTRONG WOMEN and on this page you will find 3 accomplished women with different disabilities and they accomplish all they set out to accomplish. 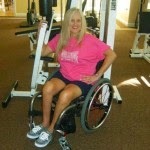 I would like to encourage your viewers to feel free to submit any of their workout tips, routines or any advice they have on WHEELSTRONG SPORTS, Inc.
For disable people, it is pretty hard to exercise of shape their body so I encourage the workout done by this great lady. I really impressed and want to share a tip for students to live happy life by getting essay writing service from our trusted website. To get maximum results, take any supplement 2 hours before a work out. I've experimented with the timing, and have discovered that a minimum 2 hours will get the job done. Drinking a ton of water is also a must.